You know the invasion has begun. We have a secret weapon. 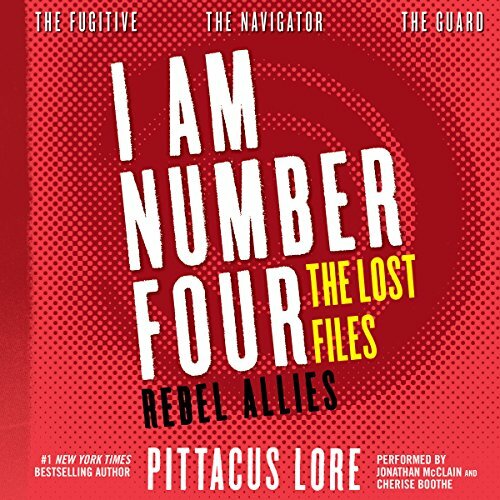 If you could sum up I Am Number Four: The Lost Files: Rebel Allies in three words, what would they be? the plot was good though some what predicable because of reading the other books in this series first. Have you listened to any of Johnathan McClain and Cherise Boothe ’s other performances before? How does this one compare? All of the performances i have listened to by them were done very well. I found my self laughing out loud like a crazy person while i was walking though are grocery store with my headphones in. if you are a lorien legacy's fan you need to read this book it fills in a lot of the puzzle pieces that are left out in some of the other books and gives some insight to lorien that i found fascinating. These afditional stories both add fun additional character development and fill in information that enhances the motivations and perspectives of all the characters. Fun to read. I loved this book. Well done. I do wish they would make the series into a TV show or redo the movie. All the material is here. They just need someone like Michael Bay and Stephen Spielberg to produce it. This is as good, or even better than most books that I have read. Feels and a lot of the gaps that a lorien legacies books have not left out, but that weren't pertinent to the story line. This spin off book made a good job of recapping everything important that happened recently in the series. Poor grocery list type reading though. Bearable. This was a great "fill in the gaps" read! Lots of questions answered here...cool different perspective on all the events and how they unfolded. A must for an Lorien fan!